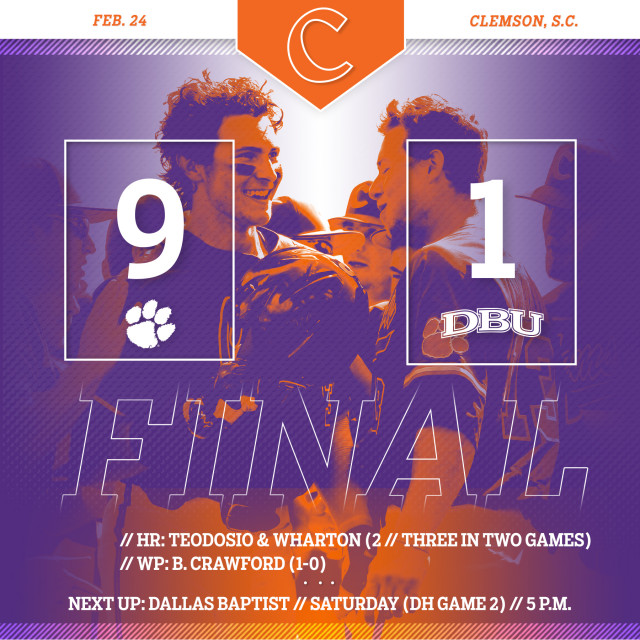 CLEMSON, S.C. – Drew Wharton hit two three-run homers to lead No. 11 Clemson to a 9-1 win over No. 10 Dallas Baptist in the first game of a doubleheader at Doug Kingsmore Stadium on Saturday afternoon. The Tigers, who took a 2-0 lead in the series, improved to 6-0, while the Patriots fell to 3-2. Wharton, who had a career-high six RBIs, started Clemson’s four-run second inning with a three-run shot. Two batters later, Bryce Teodosio lined his first career homer, a solo long ball down the left-field line. In the third inning, Robert Jolly hit a run-scoring single, then Wharton connected for another three-run homer, his third long ball of the season. Tiger starter Brooks Crawford (1-0) earned the win, as he allowed only three hits, no runs and no walks with five strikeouts in 5.0 innings pitched. Spencer Strider pitched the final 3.0 innings to record his first career save. Patriot starter Jordan Martinson (0-1) suffered the loss, as he gave up seven runs on four hits in 2.1 innings pitched. The series concludes with the second game of the doubleheader at approximately 5 p.m.